One of the most troubling elements of the budget conference agreement was the use of the Overseas Contingency Operations (OCO) account as a slush fund to circumvent the spending limits under the Budget Control Act (BCA). Specifically, the budget conference report allocated $96 billion in spending for OCO in FY 2016, $38 billion more than the President’s request, with the expectation that the additional spending would be used to increase funding for the base Department of Defense (DoD) budget above the limits under the BCA (it also provided funding above the President's budget for 2017-2021 for the same purpose). This strategy will face its first test today when the House of Representatives votes on a series of amendments by Representative Mick Mulvaney (R-SC) and Budget Committee Ranking Member Chris Van Hollen (D-MD) striking OCO funding in the appropriations bill for Military Construction and Veterans Affairs (MilCon/VA). The MilCon/VA bill reported by the House Appropriations Committee included a new section for OCO that provided $532 million in spending for construction projects that were in the DoD budget request. Reps. Mulvaney and Van Hollen offered a series of amendments that would strike this funding. While the amount of funding involved is relatively modest, the principle is very important. The votes on whether or not to maintain funding for the base defense budget that uses OCO to get around the BCA caps will set an important precedent about whether or not Congress will follow through on the plan to use OCO to circumvent spending limits. During the House debate on the amendments, Rep. Mulvaney argued that if Congress believes the BCA spending limits are too low, it should change the law and increase the spending limits instead of using OCO to circumvent the spending limits. Ranking Member Van Hollen noted that the use of OCO to fund items in the base defense budget was in conflict with the position taken by the House Budget Committee last year in their report accompanying the FY 2015 budget resolution. The report described the use of OCO for spending in the base defense budget as a “backdoor loophole that undermines the integrity of the budget process” and pledged to exercise oversight on the use of OCO that is not war-related and oppose increases above the levels military commanders say are needed to carry out operations. 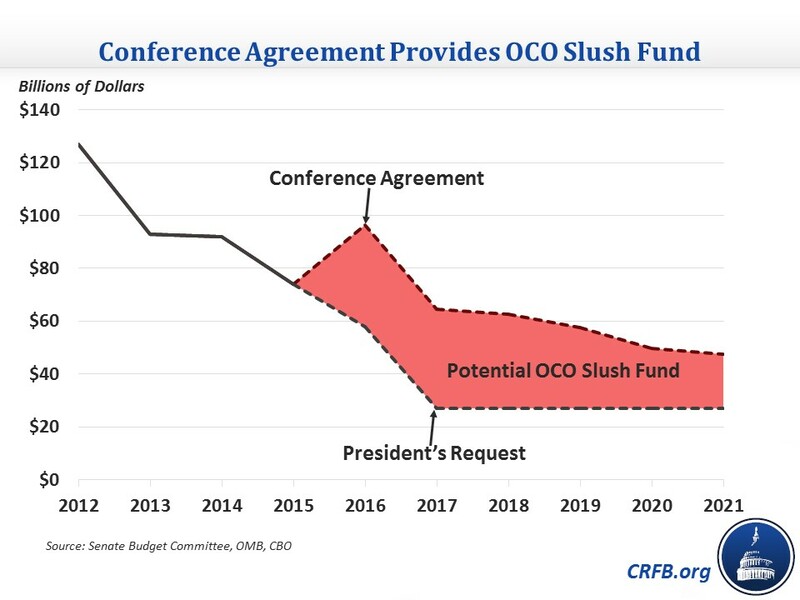 We have long warned about using OCO as a slush fund. In addition to increasing the deficit, it undermines the credibility and transparency of the budget process. It also defeats the purpose of the sequester created by the BCA, which was intended to create an incentive for Congress to enact policies reducing the deficit, by effectively providing sequester relief for the defense budget without offsetting the costs unlike what the Murray-Ryan agreement did. If Congress wishes to increase defense spending above the BCA caps, it should pass legislation increasing the caps and replace the sequester cuts with more thoughtful savings and reforms. The budget resolution conference agreement includes a reserve fund allowing this type of responsible sequester relief, similar to the Murray-Ryan agreement. Policymakers should adopt this approach, rather than relying on budget gimmicks to circumvent current law budget caps.